My favorite cut of beef is the rib eye. The marbling throughout the meat provides an unbeatable flavor and juicy tenderness. I am a cast iron junkie. I use it to make a lot of my dishes, and the best use of it all is to make my steak. You can use any heavy skillet of choice. The secret of a great steak is in the quality of the cut. I buy my meat from local halal or butcher store where meat hasn’t been frozen at all. Its a fresh cut from the local farm and they don’t need any fancy seasoning or marination to tenderize the meat. They still retain the natural tenderness of fresh cut meat and they are so tender all you need is a fork. The second secret to a great steak is in “resting” because the best steak is a juicy steak. 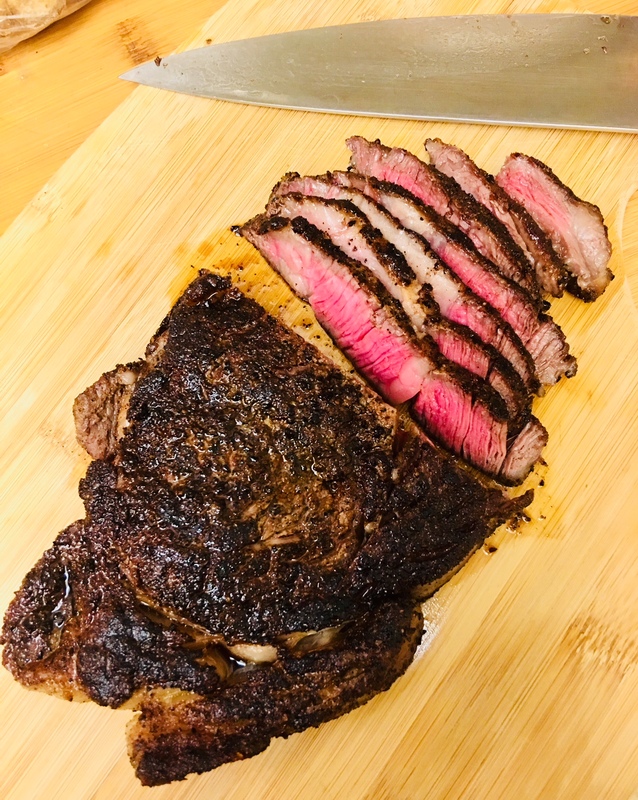 To achieve this, once the desired donness is reached, transfer your steak to a chopping board and make a tent with a loose aluminium foil or a baking pan (like i do) to rest for 10 minutes. As the steak cools down a little bit, all that yummy juice will be absorbed back into the steak making it juicy all the way through while you are eating it. Generously sprinkle fresh ground salt and pepper, garlic powder and some paprika on the meat. Once both sides are seasoned, hold the meat with a tong and tap it on the seasoning on the plate so make sure edges are seasoned as well. Heat 2 tbsp ghee on medium high in your skillet of choice. Place the steak and pat them on top to make sure the underside is evenly touching the skillet. When the edges look brown (about 5 minutes) flip it and pat on top evenly again. Another 5 minutes and your steak is ready to get some rest to seal the juices. Transfer to a chopping board or a warmed plate and cover with a loose foil or a baking pan. :- When my steak is resting, I would make my roux using the beef dripping. (Recipe on that in a later post). :- While on Whole30 i don't make roux but I did make creamy mushroom sauce once and it turned out delicious. More on that later. Slice up into desired thickness. I like my steak sliced thin, as you can see.